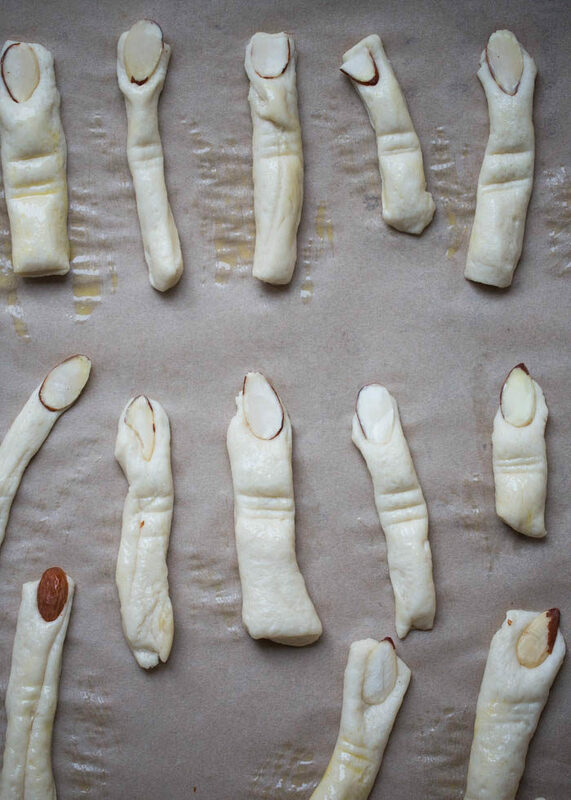 Witch finger will you eat first? 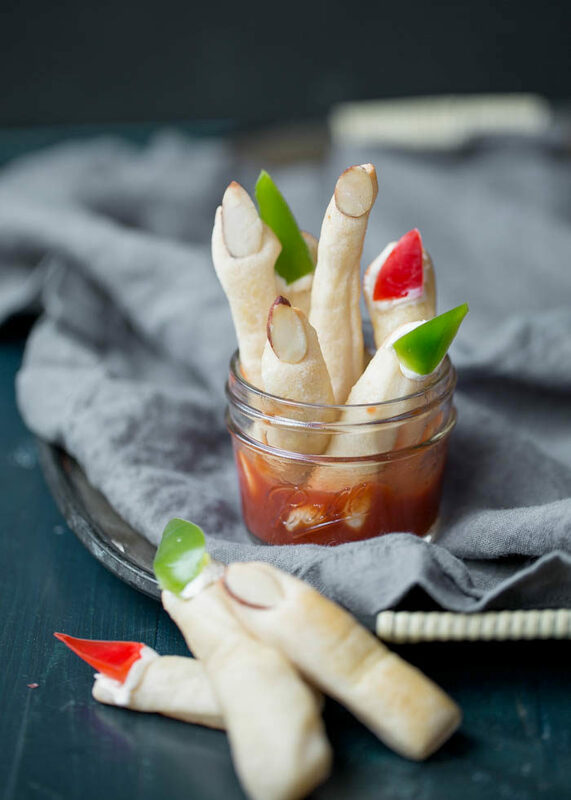 Here are two ways to make delightfully creepy witches’ fingers breadsticks – use either sliced almonds for the gnarly fingernail or go for bell pepper for a nut-free version. Mani-pedi, anyone? 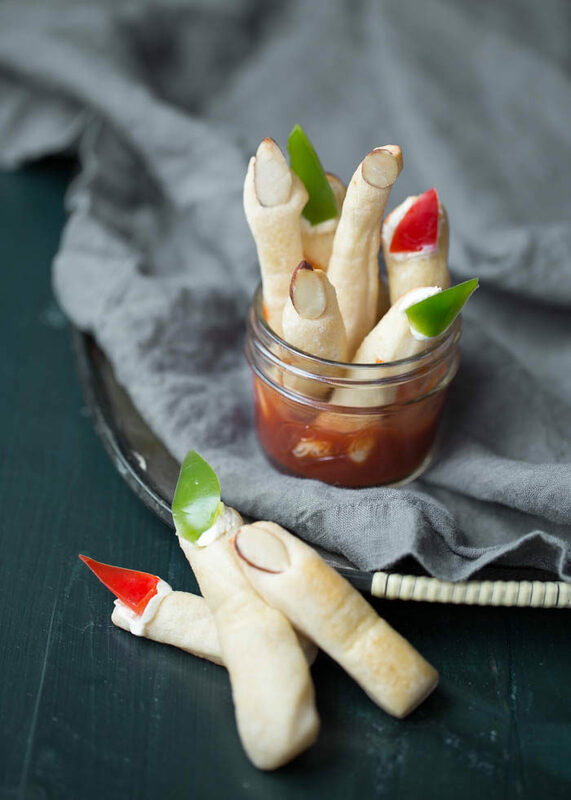 Looking for some Halloween finger food ideas? You’ve come to the right place. Like, REALLY the right place. Come hither, my pretties. That’s right… just a little bit closer. These numbers – or shall I say, digits – beckon everyone to bite the hand that feeds them. Well, at least the fingers. I wish I could say I pinpointed this idea all by myself, but I actually borrowed it from this Cheddar Witch’s Fingers recipe from Sunset. While I’m all for homemade cheese crackers like in the Sunset version, (my mom makes the most amazing cheese crackers, that reminds me – I really need to get her recipe), I’m a little short on time lately, so I decided to do this the easier way. Enter: Refrigerator section breadstick dough! 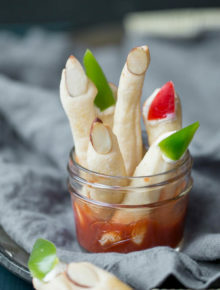 With a tube of breadstick dough and a pack of sliced almonds or some bell peppers, I can whip up some creepy severed witches’ fingers breadsticks in just about as many minutes as I can count on both hands. Too bad there are a few witches out in the world who won’t be able to say the same anymore… mua ha ha ha ha! Or, after they’ve baked, I dollop with a bit of cream cheese and a long triangle of bell pepper. I like both types for different reasons. The almonds are a bit easier – just stick them on before baking. But if you’re making these for, say, your kiddo’s classroom, you might need to go the nut-free route. If that’s the case, may I point you to the bell-pepper-and-cream-cheese option. Or make a few of both and mix ’em all together. No one witches’ finger is unique, after all! I love to make these with my daughter, not only because they’re loads of fun, but because the more rustic and gnarled up they are, the better. Meticulous perfection is NOT the name of the game here, and she likes to get a little crazy. 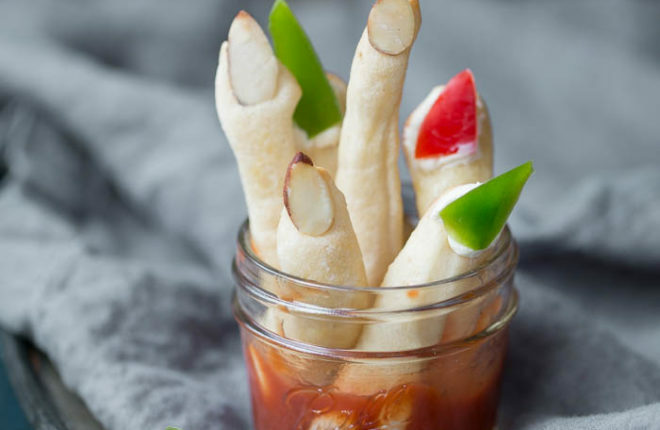 However you choose to make witches’ finger breadsticks, just go forth and make some. Then step back, look at your Halloween accomplishment, and give yourself a HAND! Preheat oven to 350 degrees Fahrenheit, or, if the temperature on your package of refrigerated breadstick dough indicates a different temperature, follow the temperature on the package. 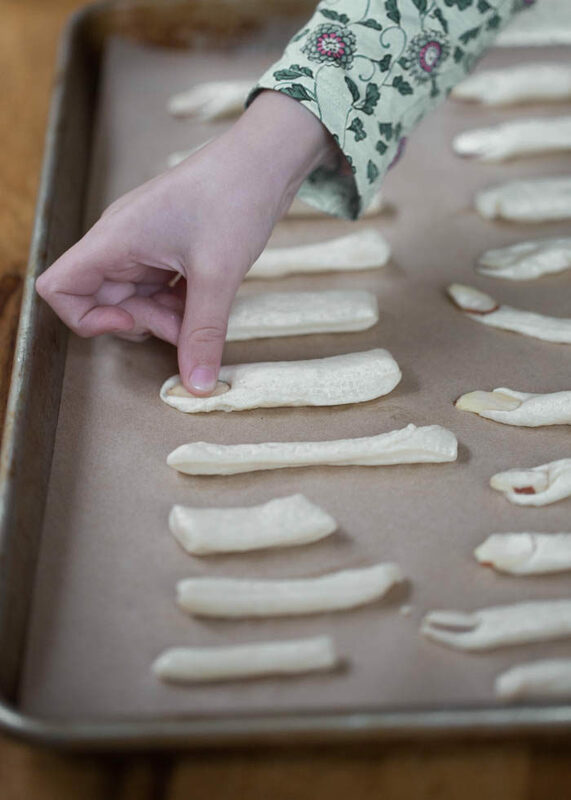 Line a large baking sheet with parchment paper or a Silpat. Unroll the breadsticks onto a large cutting board (or your counter or wherever you like to do doughy things). Roll the dough a bit to round it a bit/give it more of a finger shape. Lay it on the baking sheet. 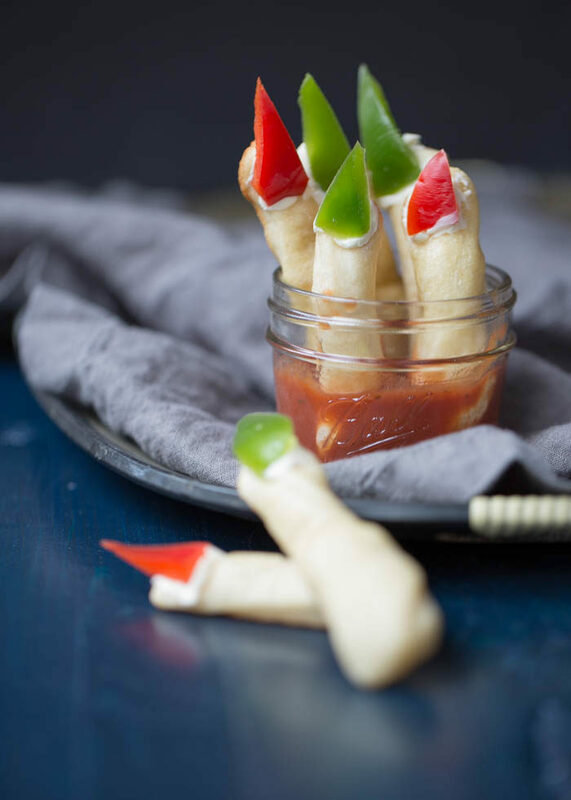 Using your thumb, press down on the narrowest tip of each breadstick. 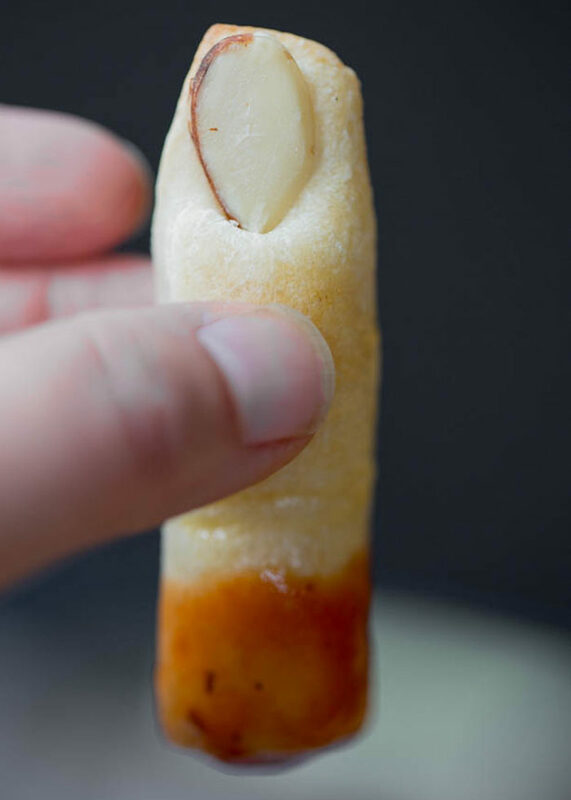 If using almonds, press a sliced almond onto each tip. If using bell peppers, you’ll add them AFTER the breadsticks have baked. Now, you have a couple of options. You can grab the pizza cutter or a bread knife and press a three or four horizontal lines into the middle of the breadstick so it’ll look a bit like a knuckle. And/or, if desired, brush lightly with egg. This will give them a slightly shinier and more golden appearance. Or skip those steps and just stick ’em in the oven already! Bake for 10-12 minutes, until puffy and starting to brown on the top. But again, if the label on your breadsticks indicates a different time, I recommend going by that time and just checking them often. Let cool for about 5 minutes on the baking sheet, then transfer to a wire rack to cool completely. 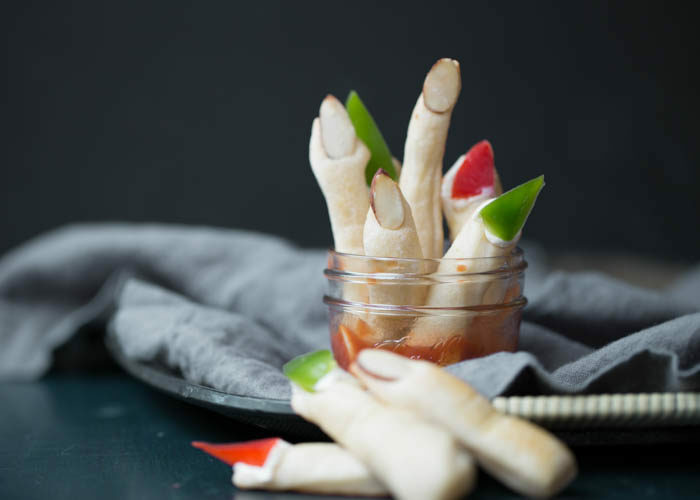 If adding bell pepper for the fingernails, after they’ve cooled, dab the tip with a bit of cream cheese and stick the bell pepper on. You may want to dry the pepper off with a paper towel so it will adhere better. Arrange on a plate or in mini mason jars filled with marinara or pizza sauce. Bloooody! 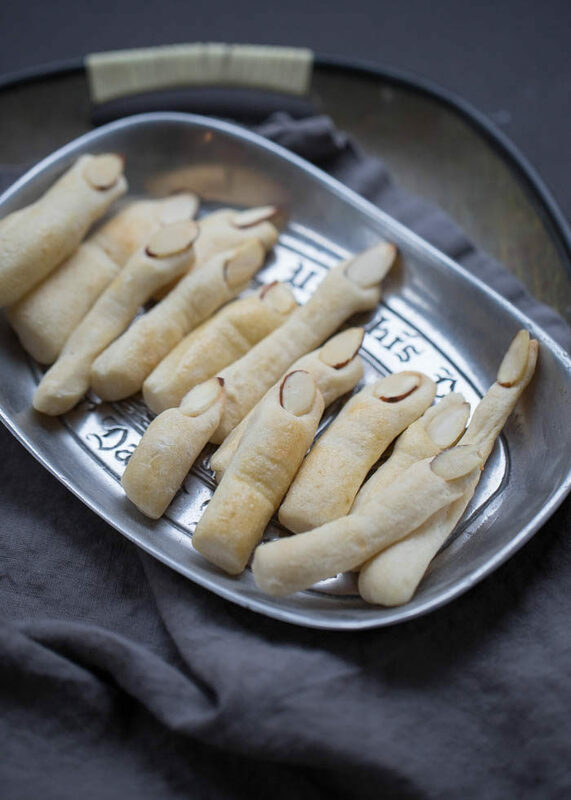 Almond-tipped fingers keep in an airtight container at room temperature for several days. Because of the cream cheese and cut pepper, I recommend storing that version in the refrigerator. Originally published Oct 22, 2009. Updated October 20, 2017. I actually made the Sunset recipe of these this year and, honestly, they were a little bland; if you ever do make them I suggest adding some type of herb. But, I’m always looking for faster, easier ways to make things in the kitchen and I love your breadstick idea!